She married Artemus Keys "Artie" Davis, May 31 1918, Westfield, Hamilton County, Indiana.1,8,9,10,11 Artemus, son of Cyrus Jessup Davis & Ella May Keys1,6,12,13,14, was born Aug 28 18981,6,12,13,14 [Aug 28 189715], Westfield, Hamilton County, Indiana1,6,12,13,14. Davis, Artie, head-of-household, age 22, born in Indiana; parents born in Indiana; rented home; occupation: farmer, general farm. Davis, Alphimae, wife, age 20, born in Indiana; parents born in Indiana. Davis, Edna M, daughter, age 11 months, born in Indiana; parents born in Indiana. Davis, Artie K., head-of-household, age 32, born in Indiana; parents born in Indiana; first married at age 20; owned home; radio in home; occupation: farmer, general farm; not a war veteran. Davis, Edna Mae, wife, age 29, born in Indiana; parents born in Indiana; first married at age 17. Davis, Alpha Mae, daughter, age 12, born in Indiana; parents born in Indiana; attended school. Davis, Chester, son, age 10, born in Indiana; parents born in Indiana; attended school. Davis, Marion, son, age 8, born in Indiana; parents born in Indiana; attended school. Davis, Dwain, son, age 2 years 8 months, born in Indiana; parents born in Indiana. Davis, Cyrus, head-of-household, age 85, born in Indiana; widower; completed 8th grade; on Apr 1 1935 was living in the same house; owned farm ($1000 value). Davis, Artie, son, age 42, born in Indiana; divorced; completed 4 years of high school; on Apr 1 1935 was living in rural Hamilton County, Indiana; occupation: farmer, rented farm. Davis, Dwain, grandson, age 12, born in Indiana; completed 4 years of high school; on Apr 1 1935 was living in rural Hamilton County, Indiana; attended school. Artie K. Davis, 83, Sheridan, died this morning at Riverview Hospital. Mr. Davis was a native and lifelong resident of Hamilton County. He was the son of Cyrus and Ella(Keys) Davis, born Aug. 28, 1897. He was a retired farmer and a member of the Lamong Friends Church. A daughter and four sons survive. They are Mrs. James (Alpha Mae) Eytcheson, Chester and Robert E. Davis, all of Noblesville, Marion Davis, Greenfield, and Dwain Davis, Dayton, Tenn. There are 12 grandchildren and 11 great-grandchildren. Frank L. Wiseman, 75, 300 Nixon St., Noblesville died Tuesday evening in Riverview Hospital. 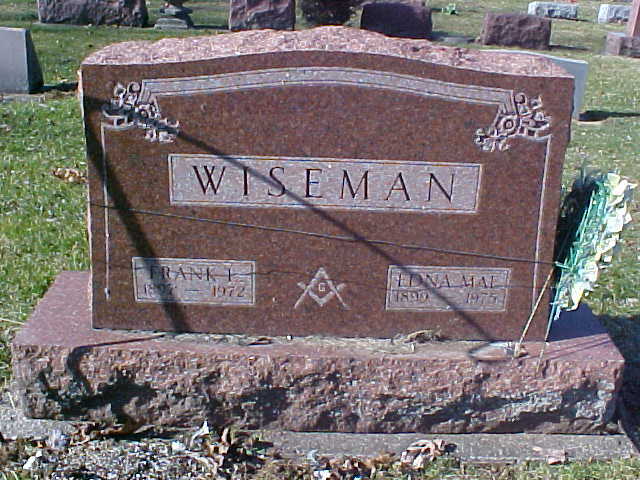 Born Jan. 31, 1897 in Wayne Township, he was a son of Marshall and Dora Harrison Wiseman. A retired machinist from Firestone, the deceased was a veteran of W.W.I; a 50-year member of the Noblesville Masonic Lodge and a member of the Noblesville Eagles Lodge. Surviving are his widow, Edna M. Wiseman; six children; Chester Davis, Noblesville; Marion Davis, Indianapolis; Dwain Davis, Maryland; Robert E. Davis, Riverwood; Mrs James Eytcheson and Mrs. Dale Hammack, both of Noblesville; 15 grandchildren and seven great-grandchildren. Edna M. Wiseman, 76, 300 Nixon Street, Noblesville, died at Riverview Hospital last night. She was married to Frank Wiseman, who died in 1972. Born May 30, 1899, she was the daughter of Chester and Alfretta (Davis) Hinshaw. A former employee of Firestone Industrial Products, she was a member of the WW I Auxiliary. Survivors are a daughter, Alphamae Eytcheson, Noblesville; four sons, Chester and Robert Davis, Noblesville, Marion Davis, Indianapolis, and Dwayne Davis, Dayton, Tenn.; a stepdaughter, Betty Hammack, Nolesville; a brother, John Hinshaw, Monticello; 12 grandchildren, and five great-grandchildren. 1900 census, Clay Township, Hamilton County, Indiana; roll T623-375, ED 80, page 8B, line #89, dwelling #188, family #189. 1920 census, Noblesville Township, Hamilton County, Indiana; roll T625-436, ED 105, page 6B, line #68, dwelling #153, family #153. Indiana, Death Certificates, 1899-2011; http://www.ancestry.com. Indiana Marriages, 1845-1920; http://www.ancestry.com (Book 15, page 125). Indiana, Marriage Index, 1800-1941; http://www.ancestry.com. Indiana, Select Marriages Index, 1748-1993; http://www.ancestry.com. 1930 census, Washington Township, Hamilton County, Indiana; roll T626-590, ED 22, page 8B, line #94, dwelling #206, family #210. 1940 census, Washington Township, Hamilton County, Indiana; roll T627-1050, ED 29-22, page 2B, line #71, household #49. Contribution from Jaime Davis (). 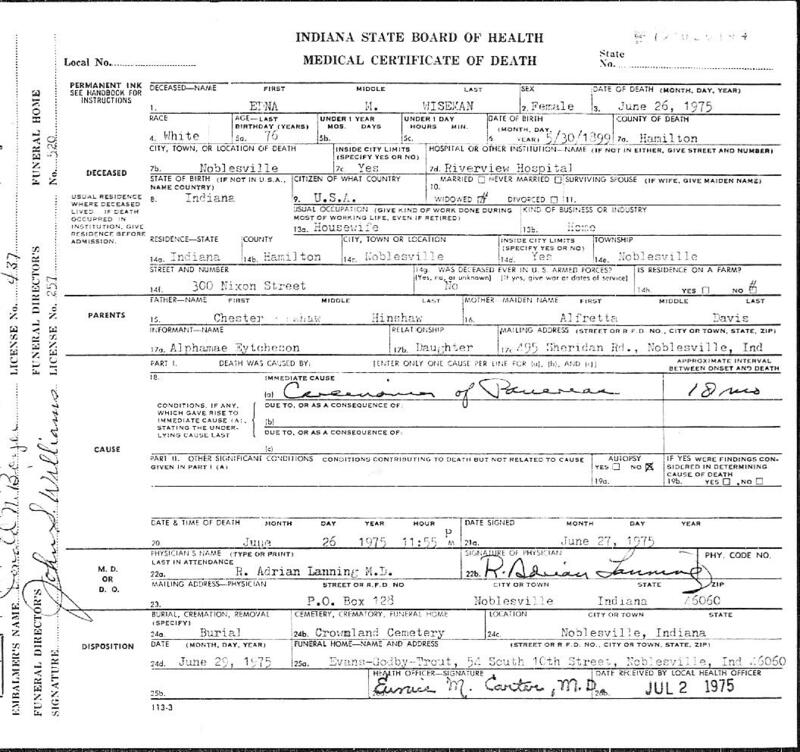 Indiana, Birth Certificates, 1907-1940; http://www.ancestry.com. U.S., Social Security Applications and Claims Index, 1936-2007; http://www.ancestry.com. U.S., Department of Veterans Affairs BIRLS Death File, 1850-2010; http://www.ancestry.com. U.S. Veterans Gravesites, ca.1775-2006; http://www.ancestry.com.